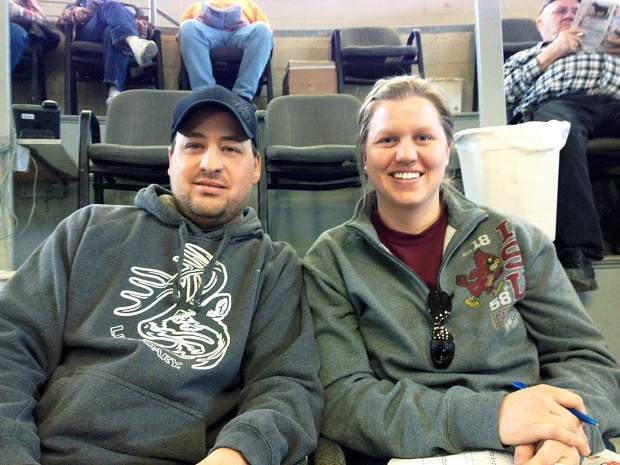 Brandon and Dixie Rusch of New Salem, North Dakota bought some fancy heifers. Lot 4, Flying W Magnum 180A, topped the sale at $7,000 to Collin Laplant of Binford, North Dakota. This RCRA Magnum PI 841 son was born 5/13/13 weighing 61lbs and had an ADJ WW of 686lbs. His EPDs are BW -4.5, WW 54, YW 96, and Milk 21. Lot 3, Flying W Advantage 194A, was sold to Stuart Gilbert of Stockport, IA for $6,500. This is a RCRA Advantage 735 son with EPDs of BW -2.1, WW 60, YW 93, and Milk 15. This good-looking rascal was born 5/16/13 weighing 72lbs and had an ADJ WW of 678lbs. Selling for $5,750 was Lot 1, Flying W XTRA 149A, to Triple M Ranch of Bismark, North Dakota. A Flying W XTRA 111X son born 5/7/13 weighing 86lbs and has and ADJ WW of 721lbs. His EPDs are BW 1.5, WW 72, YW 122, and Milk 17. Lot 2,Flying W XTRA 165A, sold for $5,000 to Jerry Shuster of New Rockford, North Dakota. This is another XTRA 111X son with EPDs of BW 0.9, WW 70, YW 115, and Milk 15. He was born 5/11/13 weighing 87lbs and had an ADJ WW of 656lbs. Also selling for $5,000 was Lot 10, Flying W Magnum 186A, to Todd McPeak from Coeur d'Alene, Idaho. This Magnum PI son posted EPDs of BW -4.5, WW 54, YW 96, and Milk 21. He was born 5/14/13 weighing in at 88lbs and has an ADJ WW 684lbs.